WV Strong Hurricane Relief has been setting up at different locations within the area to pick up donations for victims of Hurricane Florence. OHIO VALLEY — A hurricane relief mission to Texas has expanded to natural disaster relief missions across the gulf coast and even further. Cat Hopper, of Triple H Farms in Fraziers Bottom, shared he and his wife Sandy Hopper began WV Strong Hurricane Relief last year when Hurricane Harvey hit Houston, Texas. Cat commented he was born and raised in Houston and felt he had to help his hometown in its time of devastation. Cat, who is an employee at West Virginia Department of Highways, got two trucks each with a 48-box trailer to haul supplies. He and Sandy donated roughly 30 tons of supplies to victims in Houston. When Hurricane Florence hit North Carolina, Cat shared he and Sandy knew they had to pitch in to help these victims as well. He said they are not only serving the Gulf Coast when hurricanes strike, but they will be there to provide relief to any area that suffers a natural disaster. For this mission to North Carolina, Cat and Sandy have partnered with Hands That Help Ministries and Pioneer Ranch in Leon. All of the donated relief items are being transported to Balm In Gilead Ministries in Fayetteville, N.C., said Cat. He explained Sandy has already taken one truckload of relief items down and they are currently working to fill the second truck. 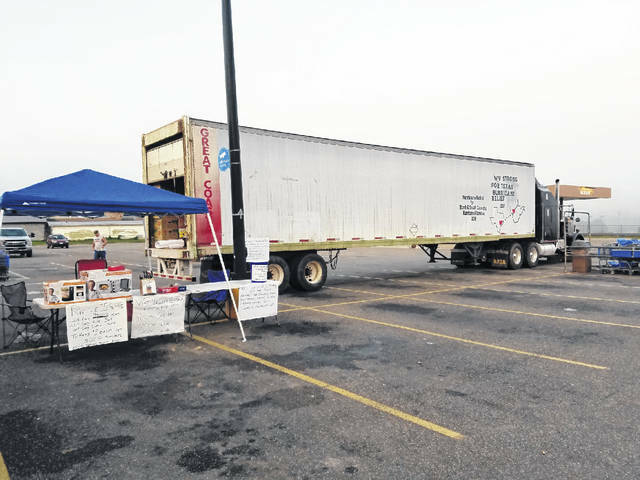 Cat commented WV Strong Hurricane Relief has been set up at different locations within the area to pick up donations such as Piggly Wiggly in Point Pleasant, Wal-Mart in Gallipolis, Ohio and Wal-Mart in Mason. This week’s location is to be announced and those interested in donating can follow WV Strong Hurricane Relief on Facebook. Also, those interested in donating may take their items to one of the drop off locations, J&R Auto Repair in Point Pleasant or Faith Christian Fellowship church in Buffalo. Cat commented several local businesses and organizations have donated items and one of his volunteers, James Hess, is trying to coordinate with Mason County Schools for school-wide donations. Cat shared how grateful he is for a few of his “dedicated volunteers” including Hess of Leon, Jessica Wolfe of Leon, and Leonard and Annette Taylor of Leon. WV Strong Hurricane Relief is in need of the following items: non-perishable foods (no sugar, low sugar, no sodium, and low sodium items are especially needed); bottled water; cleaning supplies; personal hygiene items and feminine products; general household items (toilet paper, paper towels, disinfectant wipes, etc. ); baby items (food, diapers, formula, etc. ); first aid kits and supplies; diabetic testing supplies;livestock feed; veterinary first aid supplies; pet food; shovels, brooms, mops, buckets, and disposable gloves. WV Strong Hurricane Relief is not accepting clothing or refrigerated/perishable items at this time.